On Hurricane Hazel’s 62nd anniversary, I remember the most devastating storm that ever hit Toronto. It struck during the overnight hours of Friday October 15, 1954, flooding the Humber and Don River Valleys, causing the authorities to declare the bridges that spanned the rivers unsafe. Toronto became an island, residents unable to travel either east or west of the city. During the late hours of the Friday evening, I remember watching the rain pelt the windows of our home. The water gushed down the glass in torrents, the houses across the road rendered invisible. Close to midnight, when I went to bed, I had no idea what would occur throughout the city during the early-morning hours. In Toronto’s two main river valleys, flood waters rose so swiftly that many had no time to reach safety before their dwellings were either swept away or they were underwater. The worst hit was Raymore Drive, near Lawrence Avenue West and Scarlett Road, where almost 40 people perished. The Saturday editions of the newspapers were already in print before the disastrous details of the storm were known, and in this decade, there were no Sunday newspapers. The newspapers on Monday were the first opportunities to relate the events. The following photographs are from the Toronto Daily Star of Monday, October 18, 1954. Two houses from Raymore Drive and Gilhaven Avenue that collided, one of them demolished by the torrent of water. Gilhaven Avenue the morning after the storm, when the flood waters had receded. Bridge over the Don River on Bathurst Street, between Lawrence and Finch Avenues. The devastation at Holland Marsh, near Highway 400. A house in Holland Marsh that during the night had been surrounded by 20 feet of water. Houses in Holland Marsh near Schomberg Creek. Bridge over the Humber River on Lawrence Avenue West, east of Scarlett Road. Pine Grove Park in Woodbridge Ontario. Raymore Drive, near Scarlett Road and Lawrence Avenue West, showing the houses that were swept away by the waters. Another home on Raymore Drive. My earliest memories of the Peter Witt streetcars on Toronto’s Yonge Street date from the 1940s. In that decade, the intersection at Yonge and Queen was the commercial heart of the city, as it was where Eaton’s and Simpsons department stores were located. It was when my mother journeyed downtown to shop at Eaton’s that I first rode on these streetcars. Later, as a teenager, these cars became an integral part of my life as the major movie theatres were located on Yonge Street or within close proximity to it. Also, Maple Leaf Gardens was only one block east of Yonge. In the 1950s, the theatres on Yonge and “The Gardens” on Carlton Street were among the most important entertainment venues of the city. In past decades, people who lived west of Yonge Street rarely journeyed on the streetcars to areas east of Yonge. There was little incentive, since when you arrived at Yonge, the main commercial establishments of the city were readily accessible. People who dwelt east of Yonge, similarly did not ride the streetcars west of it, for the same reason. However, everyone rode on the Yonge Streetcars. They were the best known and most frequently travelled in all of Toronto. This is why it was logical in the late-1940s to begin building the city’s first subway under the street. The most famous of all the Yonge streetcars were the Peter Witt cars (1921-1963). They required two men to operate, but I seem to remember that in the 1950s, some of the smaller models, such as those on Bay and Bathurst Streets, required only one person. On these, the motorman collected the fares. On the larger Yonge Street cars, passengers boarded by the front doors, which folded back when opened. The driver (motorman) sat at the front of the car, but people basically ignored him, since he did not collect the fares. Behind the driver was a large box that in winter held sand to provide traction on icy streetcar tracks. Passengers who sat or stood at the front of the car did not pay their fare until it was time to depart. Then, they exited through the centre doors, where the conductor sat. People dropped their tickets or cash into the fare box located beside the conductor, and were given a transfer if they required one. They then stepped down to the roadway. The centre doors did not fold back, but slid across to open. The conductor controlled the doors, and also maintained the coal stove that provided heat in winter. It was located opposite the conductor. Passengers seated or standing at the back of the car had already paid their fare, so when it was time for them to depart, they simply exited via the centre doors. When I was a boy, all the seats were covered with what appeared to be brown leather. I always pleaded with my parent to pass by the conductor and pay the fare. This was because I wanted to sit in the seat at the back of the car. It was huge, with large windows surrounding it on three sides, providing a panoramic view of the street. When I was a teenager, I preferred the window-seats, which were on the sides of the cars. Their windows provided a better breeze on hot summer days. On the ledge of each window there was a small brass plate, and on it were engraved the words, “Keep Arm In.” Teenagers invariably enjoyed teasing fate by sticking their heads out the window. However, when another streetcar was approaching from the opposite direction on the other track, at the last moment they quickly pulled their heads inside. My parents continually warned me not to imitate the older kids. In winter, my preferred seat or standing space was near the stove. The Peter Witt streetcars contained engines with sufficient power to pull a trailer up a steep incline. This was necessary, since the hill on Yonge Street, north of Davenport Road, was quite severe. Trailers possessed two large centre doors that opened by sliding back. The door on the right was for boarding, and the one on the left for exiting. Inside the trailer, there was a space between the two doors where the conductor sat to collect the fares. Similar to the cars that pulled the trailers, passengers did not pay their fares until they passed the conductor. After arriving at Front Street, the Yonge streetcars looped around Union Station. Thus, many immigrants caught their first sight of the city from their windows. My father arrived as a young man in Toronto in 1921, from a small village on Canada’s east coast. It was the first year that the Peter Witt cars commenced operating in the city. He viewed them as modern and up-to-date. When he departed Union Station and boarded a Yonge streetcar, it was a warm day in May. Despite the brass plaque on the ledge of the window, I am certain that he stuck his head out to gawk at the skyscrapers on Yonge Street, especially those between Front and Queen Streets. The sight of the enormous Loew’s Theatre (the Elgin), north of Queen, and the Pantages (the Ed Mirvish) caught his imagination. Years later, he told me that on that occasion he had vowed to visit them as soon as possible. An older brother, who had been in Toronto for several years, had told him about the “naughty” vaudeville shows. For many decades, the Yonge cars were the main means of journeying to the St. Lawrence Market on Front Street. During World War 1 and World War 11, thousands of soldiers departed for overseas and returned home after the wars from Union Station. Many of these men and women travelled to the station or journeyed away from it on the Yonge streetcars. During the 1940s, I rode on them to attend the circus at Maple Leaf Gardens and to visit Santa Claus at Eaton’s Toyland. When I was a teenager, I attended theatres such as the Tivoli, Imperial, Loew’s Downtown, Loew’s Uptown, Downtown, Biltmore, Savoy, Odeon Hyland, and the Hollywood via the Yonge cars. In 1921, Toronto’s contract with the Toronto Railway Company for the transportation needs of the city ended, and it was not renewed. City Council had realized that because the city was expanding rapidly, it was necessary to become more involved, so created the Toronto Transportation Commission. It purchased the streetcars of the former company (the TRC). Several years before 1921, the city had been aware that many of the streetcars they would inherit were in poor condition. They began making plans and after careful research, they negotiated a license to allow them to place a contract for a fleet of Peter Witt streetcars. They had been designed by a commissioner with Cleveland Street Railway Company, and named after him. There were seven different series, allowing for variations in size, but they all possessed a similar appearance—solid, square-shaped, with straight lines. The cars were ideal for transporting large numbers of passengers on busy downtown routes. Their heavy steel bodies were well suited to Toronto’s severe winters, and contained large windows for good ventilation on hot summer days. They seated about 60 passengers, with sufficient standing room for many more. Toronto ordered 575 of the streetcars, 350 of them with engines. The other 225 were trailers that were pulled by the streetcars with motors. The Canadian Car and Foundry Company in Montreal was given the contract and most of them were built by this company. However, 50 were sub-contracted to the Ottawa Car Company, and another 50 to the Preston Car Company. To introduce Torontonians to the new streetcars, one of them was exhibited at the CNE in August of 1921. Their debut on Toronto streets was on October 2nd of that year. The first streets to be converted entirely to Peter Witt cars were the busiest routes—Yonge, College, Dundas and Bloor. However, the Yonge cars became the most famous of them all. In the 1920s, the cars had wooden seats and coal stoves for heating in winter. The brakes were operated by compressed air. However, in the years ahead the seats were upholstered with brown leatherette material, and the heating system changed to forced-air from electric heaters. For several decades, the streetcars were the work-horses of the system. However, in 1938, the sleek Presidents’ Conference Cars (PCCs’) were introduced, which soon became known as the “red rockets.” They slowly replaced the older Peter Witt cars. The Peter Witt cars stopped serving the Yonge Street line on March 30, 1954, when the Yonge Subway opened. However, the last of these streetcars did not disappear until 1963. After the Peter Witt car removed from service, they were stripped for useable parts and the remainder sold for junk metal. Peter Witt streetcars arriving at the York Street station in December 1922. Toronto Archives, S0071, item 1514. Left-hand photo shows the front of car number 2558, which was employed on the Yonge Street route. The right-hand photo is of the back of the same streetcar. Toronto Archives, S 0071, Item 3152 (left photo) and the right-hand photo, F0071, item 3133 (right). Both photos were taken in April 1924. Passengers boarding Peter Witt car #2520. In the background is the Royal York Hotel. The photo was taken in 1928, when the hotel was under construction. It appears that the streetcar is southbound on York Street. Scott Street is one block east of Yonge. I am uncertain about the routing of the streetcar, but it possibly journeyed east on Front to Scott, then north to Front, west on Front, and then, north on Yonge. Toronto Archives, S 0071, Item 6396. View from the rear, looking toward the front doors of car # 2536. Photo taken on January 6, 1932. In this decade, the seats had wooden slats. Toronto Archives, S 0071, item 9056. View of the rear of same car as in the previous photo, on January 6, 1932. Toronto Archives, S 0071, item 9059. Entrance of the same car on January 6, 1932. I do remember this type of Peter Witt streetcar, when the driver was enclosed in cabin with a door. Toronto Archives, S 0071, item 9060. Passengers in a Peter Witt car in 1928. The driver is enclosed a cabin and the conductor can be seen in his booth. Toronto Archives, s 0071, item 6398. Ceiling of a car in 1924, with the advertisements above the windows and on the ceiling. Toronto Archives, F 0071, Item 3153. View looking toward the front of car #2590 on March 2, 1923. The conductor’s seat between the centre doors can be seen, as well as the coal stove. Toronto Archives, S 0071, item 1914. A trailer car in 1928. Visible are the centre doors and the section in between where the conductor sat. Toronto Archives, S 0071, item 5773. Yonge Street north of Queen on December 24, 1924. The Eaton’s store (demolished) is on the left, its north facade on Albert Street, which no longer extends to Yonge Street. The Eaton Centre is now on Yonge between Queen and Dundas. A Peter Witt car with a trailer attached is travelling northbound. Toronto Archives, s 0071, item 3632. Yonge Street looking north from King Street on December 24, 1924. The Peter Witt trailer is southbound toward King. On the east side of Yonge is the Strand Theatre, built in 1919. Toronto Archives, s 0071, item 3631. Gazing north on Yonge Street from Queen Street in 1935. On the east side of the street is Loew’s Downtown, which is now the Elgin Theatre. The buildings on the northwest and northeast corners of the street still exist today but are employed for other commercial purposes. Toronto Archives, s 0071, Item 11703. A Peter Witt streetcar photographed in the 1980s at the Halton County Radial Railway Museum. The interior of the same streetcar at the museum. This is the type of car that I remember on Yonge Street, with the padded brown leatherette seats. The publication entitled, “Toronto’s Theatres and the Golden Age of the Silver Screen,” explores 50 of Toronto’s old theatres and contains over 80 archival photographs of the facades, marquees and interiors of the theatres. It relates anecdotes and stories by the author and others who experienced these grand old movie houses. Another book on theatres, published by Dundurn Press, is entitled, “Toronto’s Movie Theatres of Yesteryear—Brought Back to Thrill You Again.” It contains over 125 archival photographs and relates interesting anecdotes about these grand old theatres and their fascinating histories. The 1980s was dominated events such as Terry Fox Marathon of Hope, the patriation of the Canadian Constitution, Toronto’s 150th birthday, Canada becomes 120 years old, and the end of the Pierre Trudeau years. As well, the world was shocked by the assassination of two political leaders. Toronto Star, October 6, 1981. Toronto Star, April 18, 1982. Toronto Star, March 1, 1984. Toronto Star, March 6, 1984. Toronto Star, October 31, 1984. Toronto Star, November 1, 1984. Toronto Star, July 2, 1987. The newspaper headlines of the 1970s do not reflect the same degree of turmoil as the previous decade. However, federal elections in Canada and the United States created political drama. The Toronto Daily Star on November 10, 1970, reporting the death of Charles de Gaulle. The final edition of the Toronto Telegram newspaper, October 30, 1971. The Watergate scandal finally topples the Nixon administration, August 8, 1974. Notice that the newspaper is now named The Toronto Star. Toronto Star reporting the resignation of Richard Nixon, August 9, 1974. The 1979 Canadian Federal election, Toronto Star, May 22, 1979. The Conservatives win the election, May 23, 1979. In 1951, I began collecting Toronto newspapers that I considered milestones in history. Included in the collection were Life Magazines and copies of the Star Weekly, a magazine inserted in the Toronto Daily Star (Toronto Star) each Saturday between the years 1910 and 1973. l recently, I sorted through these old newspapers, reliving the memories they contained, some of them pleasant and others sad. In some instances, I remember where I was the day the headlines appeared. Copies of the newspapers are available on microfilm in the archives and online, but seeing the originals caused me to recall when I first glimpsed them on the doorstep of our home or in a newspaper box. Sometimes my first sight of them was on the kitchen table, after one of my parents retrieved it from the veranda. The kitchen table was the centre of everything in our house and the place where the news of the day was discussed. Viewing the old newspapers again after all these years, I recalled the shock, fascination and amusement my parents expressed as they saw the daily headlines. I recently read an online article asserting that no one under the age of 50 reads hard copy newspapers any more. Unfortunately, this might be close to the truth, but I believe it is their loss. My viewpoint is prejudiced, as I am over 50 and receive two newspapers daily. I often employ my iPad to learn about the latest news, especially when I am travelling, but I do not feel as connected to the events as when I read a newspaper. For me, a newspaper has more visual impact, and besides, news posted on social media is basically derived from newspaper reports. Perusing the newspapers in my collection, the emotions that I felt when I originally read them were revived. The photos and newspapers shown in this post represent a vastly different world from today. When the 1950s dawned, World War II had ended just five years earlier and the scars of war had not completely healed. Entertainment was more than an indulgence or mere pastime, as people sought ways to erase the memories of casualty lists and horrific reports front the front lines in Europe or the Pacific. One of the most popular ways of achieving this was to attend the movie theatres of the city. In the 1950s, they were scattered throughout every community in Toronto, their newsreels one of the few sources of visual images of events of the day. Newspapers were the other source. They linked people to the world beyond their neighbourhood. Because radios offered no visual images, people depended on newspapers and magazines. Hence the importance of the Star Weekly magazine that appeared in The Daily Star each Saturday. Movies allowed people to dream, and for many, the dreams included an escape from the inner city to suburban communities surrounding Toronto, where there were ranch-style homes on spacious building lots. Picket fences and two-car garages were not mandatory, but were highly desirable. Sales of automobiles soared and purchases of consumer goods to furnish the new homes increased exponentially. Patriotism and national pride engendered by the war years remained, including loyalty to the king and queen who had led them through the years of conflict. Toronto was fascinated by their young daughter, Princess Elizabeth, heir to the British throne, and her handsome husband. The fascination peaked in 1951 with the announcement of the couple’s royal tour of Canada, which included a visit to Washington. Television sets remained rare in 1951, meaning that the newspapers and newsreels in theatres were the main sources of images and information about the tour. This photograph by the famous portrait photographer Yousuf Karsh of Princess Elizabeth was inserted in the Star Weekly magazine on September 21, 1951, printed as a two-page spread. Recently, (March 2015) I saw a copy of the upper portion of this portrait in the window of a cheese shop in the Kensington Market. It was badly faded, but it brought back memories of when I first saw it. I don’t know why it was in the shop window, after all these years. Life magazine of October 1, 1951. Americans were also interested in the royal tour as it included a visit to Washington. November 1, 1951, The Telegram newspaper, reporting the princess’ visit to Washington. Cover of the Star weekly of November 3, 1951, a special edition issued in honour of the royal tour of Princess Elizabeth. Although Churchill captured the headline on November 12, 1951, Princess Elizabeth still dominated the news. The Toronto Telegram of November 12, 1951, at the conclusion of the royal tour. On another note, the Star Weekly reported about a rooky hockey player on November 17, 1951. The young star was Bernard Geoffion. This photo from the Toronto Star of February 6, 1952 marked the end of an era. The king who had inspired the British nations during the World War II had passed away. I was sitting in a classroom at Vaughan Road Collegiate when the principal announced over the PA system that the king had died. There were tears on the cheeks of some of the teachers, especially those who had served in the Second World War. My home room teacher was among them. It was a moment I never forgot. Toronto Daily Star, February 6, 1952, the day King George VI died. In the days after the passing of King George VI, speculation commenced about the coronation of the young queen. The headline prediction did not materialize, as the coronation was eventually set for June 2, 1953. The 1950s newspapers shown in this post were published in a decade when the movie theatres of Toronto were the major entertainment venues of the city. My recent publication entitled “Toronto’s Theatres and the Golden Age of the Silver Screen,” is akin to a book of memories of this former decade. 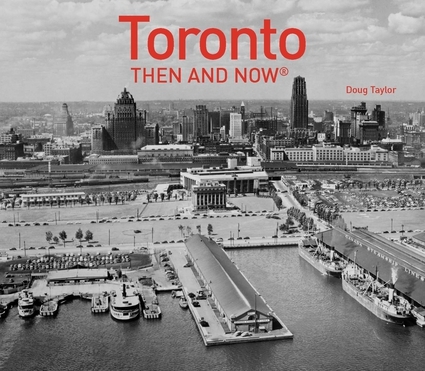 The publication explores 50 of Toronto’s old theatres and contains over 80 archival photographs of the facades, marquees and interiors of the theatres. It relates personal anecdotes and stories of others who experienced these grand old movie houses.